With a rising student population at Binghamton University, seating options throughout the University Union have become sparse. To address this issue, BU’s Physical Facilities and Union staff are planning renovations to the basement of the complex beginning next summer and carrying into fall 2019. The project was conceived in 2015, when a consultant was asked to examine the layout of the University Union. According to Suzanne Howell, director of Residential Life and associate dean of students, administrators wanted to gain better understand of how people were using the building space and determined the basement was not being used to its full potential. According to Howell, she and Randall Edouard, interim dean of students and assistant vice president for student affairs, have discussed renovating the Union’s basement with several Student Association (SA) presidents over the past three years. This semester, as the project began to solidify, the SA Executive Board has served in an advisory role, meeting biweekly with Howell and Peter Nardone, general manager of the Union, to discuss project updates and provide student feedback. At the annual State of the SA address held on Monday, Nov. 12, the SA E-Board announced the $2 million campus renovation, among other projects. According to Jerry Toussaint, SA president and a senior majoring in philosophy, politics and law, the project to renovate the Union is just one part of a larger University initiative to revamp the entire campus and ensure that all of its spaces are being utilized to their fullest capabilities. During spring 2018 SA elections, Toussaint ran for SA president on a platform that included reclaiming the University Union as a space for students, a promise the basement renovations may help him fulfill. 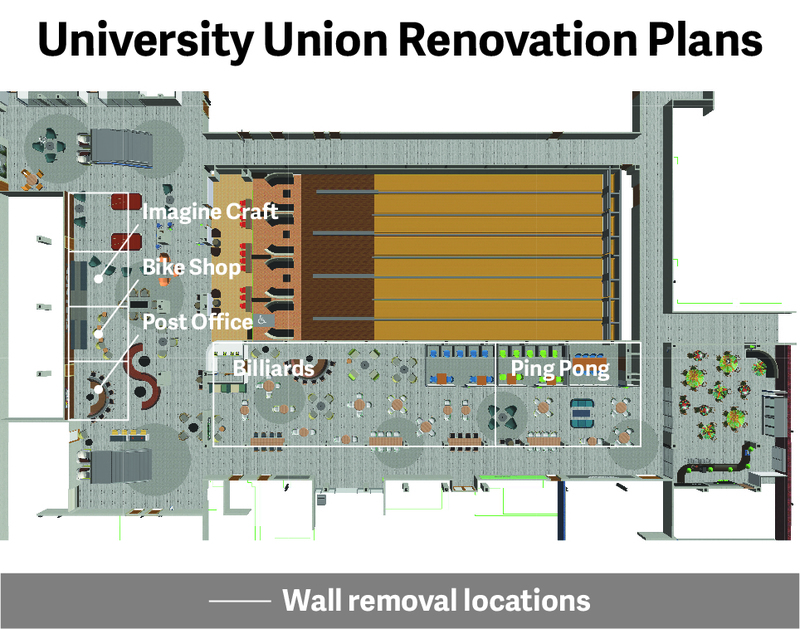 The current plan includes tearing down walls to replace them with glass sliding walls, creating a more open space in the bowling area while combining the billiards room, table tennis room and hallway to accommodate players and spectators in the game areas. Despite the wall removals, the new space will include a few enclosed study areas for privacy. There will also be expanded and more relaxed seating options. In November, students were offered the opportunity to view and vote on furniture and provide responses to be taken into consideration by project managers. Additionally, the current plan will work with the Food Co-op to install a moveable wall in the space. The Food Co-op will keep its current tables and chairs, but will receive updated kitchen appliances. Kevin Darrell, SA vice president for finance and a senior double-majoring in accounting and mathematics, said he helped plan the renovations and is excited to see the finished product. However, some students expressed mixed feelings on the plans. Daniel Devlin, a junior double-majoring in history and classical and Near Eastern studies, said he thinks the renovations are a great idea. But others were hesitant to embrace the changes, especially the Food Co-op renovations. Ava Glasser, a senior majoring in environmental studies, said the renovation plans should leave the Food Co-op as it is. Glasser also questioned the necessity of the renovations, and said the money could be better spent elsewhere. Toussaint said he expected some pushback on details of the renovation plans, which is why the SA E-Board aimed to collect feedback from students. Darrell said he hopes the University will continue to seek the feedback of the general student body throughout the implementation of the project. The renovations are scheduled to be completed by Dec. 1, 2019.